Maori, the indigenous people of New Zealand call this country as Aotearoa, which means the land of the long white cloud. Maori are very adept at hunting and fishing. They make nets to catch fish and carve out a fishing pole from bone and stone. One of the birds they hunt is moa, the biggest bird in history that is not biased to fly and now extinct. They are also experts in growing crops, mostly plant and other types of bulbs. Europeans who first discovered this country was a Dutch explorer named Abel Tasman. At that time he was on an expedition searching for great continent in the southern hemisphere. At that time the continent is referred to as the Great South Land and believed contains rich minerals. In 1642, while searching for the continent. Tasman saw highlands west coast of South Island. Abel Tasman claimed parts of the country with the name Holland Staten Landt later renamed New Zealand by Dutch cartographer. Tasman’s first contact with the Maori occurred on the west coast of South Island. However, due to a misunderstanding, disputes between the Tasman and Maori Nation make sent four people to the Tasman small boat killed. Tasman actually never set foot in New Zeland. After sailing to the West Coast and several islands in the Pacific Ocean, the Tasman returned to Batavia which is now known as Jakarta. The mission of the New Zealand mainland for the claim fails. In 1769, a British explorer, Captain James Cook also was in search of continents in the southern hemisphere, when one of the cabin crew saw land near Gisborne. Cook successfully circumnavigated, create maps, and even led two expeditions to the country again. Prior to 1840, Europeans who come to New Zealand mostly seal hunters, whalers and missionaries. They established trade relations with the Maori to supply firearms and buy natural resources such as timber. 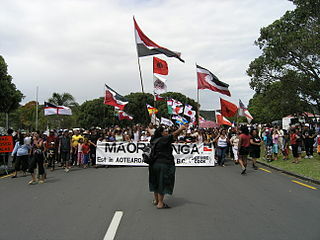 In 1840 occurred Waitangi treaty between the British government with the Maori. At that time there were about 125 000 Maori and 2000 Europeans living in New Zealand. The contents of the agreement is an agreement that the Maori would be a British colony led by the Queen of Great Britain. However, there are a few grains of the agreement are being debated and differences in perception that lead to conflict. After signing the agreement the British Government considers that they are entitled to the whole of the Maori sovereignty, land, and natural resources. While the Maori believed that they only gave permission for the British people to use their land. The conflict occurred in the 19th century, known as the New Zealand Land Wars. Heavy casualties on both sides, but the winner is britain. Almost all land in New Zealand seized by the British government. In 1975, the signing of the treaty of Waitangi birthday. Of the agreement. Most of the land claim has been returned to the Maori and has also been awarded compensation. Although the Waitangi treaty is still being debated to this day, the agreement is considered an important document as the basis for the establishment of the state of New Zealand.